The social media revolution has been integral to communication across the Muslim world. From the Arab Spring and active youth engagement to extremist recruitment and networking, digital diplomacy and social media use have transformed the communication paradigm in international relations. So what does this mean for regimes and voters? For terrorist organizations? 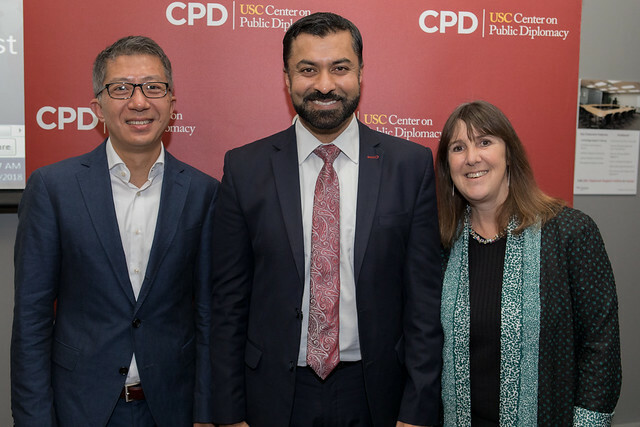 Dr. Haroon Ullah discussed his new book, Digital World War: Islamists, Extremists, and the Fight for Cyber Supremacy, which outlined social media’s influence on the Muslim world, and its implications for regional and international politics. Moderating this program was Karen North, Professor of Communication and Director of the Digital Social Media program. Dr. Haroon Ullah is Chief Strategy Officer for the Broadcasting Board of Governors, an $800 million global media agency. A former senior adviser to three Secretaries of State, Haroon’s expertise includes digital transmedia strategy and countering violent extremism. He is a Peabody TV Award recipient, an Adjunct Professor at Georgetown University and a term member of the Council on Foreign Relations. An award-winning author, Digital World War (Yale University Press) is his third book. Karen North, Ph.D. is a recognized expert in social media and in psychology. She is the Director of USC Annenberg's Digital Social Media (DSM) program, and a Clinical Professor in the School of Communication. DSM (formerly, Annenberg Program on Online Communities) is the world’s first master’s degree program and research center focused on the leadership and management of social media and online communities. Trained as a clinical and social psychologist and with considerable work experience in telecommunications policy and practice, Dr. North’s interests come together in the digital world where entrepreneurs and large companies seem most focused on using social and digital media to bring people together and form groups online. Prior to building USC’s online communities (social media) program, Dr. North was the Assistant Dean of the UCLA School of Public Policy. She previously worked in the Clinton Administration in the White House Office of Science and Technology Policy, and before that she worked for Rep. Edward Markey, Chairman of the US House of Representatives Subcommittee on Telecommunications and Finance. Missed the event? Click here to watch the full Facebook video.